I am a big food fan, a foodie perhaps. I love every aspect of food, starting from going to the vegetable market, cooking them and finally enjoying the flavor. A good dinner evening; whether in my own kitchen or at a restaurant would make me not only happy but content :). I have a full time work and I get back to my room at around 6pm everyday. Although I love cooking, I fear that cooking everyday would make me less interested in the act and would make me think of cooking as a responsibility rather than enjoying the art of it. Today, in my very first day as a blogger and in my first post, I will talk about a dinner evening in my kitchen. 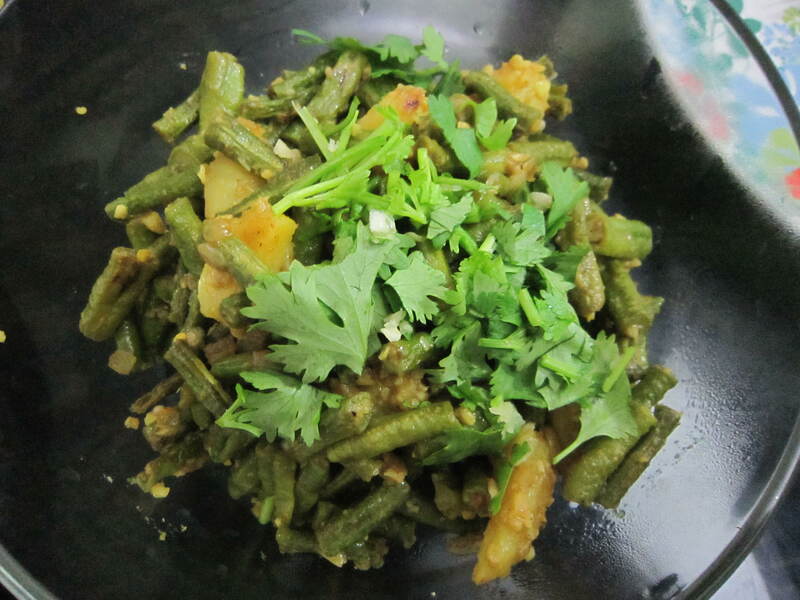 But today I am going to talk about a typical nepali dinner I prepared a few days back. Let me give you some background about A’s cooking skills before I start. As much as A loves eating, A hates cooking, yes he does. If I were to ask him to cook for me, he would not exactly say no, but he would be very unhappy, it would show on his face and he would start giving me alternatives like, “Why don’t we order pizza today and watch that movie we wanted to watch since a long time?”. And when i’d say nothing to this, he’d go on, “In that case, lets go to B town and eat the Thai butter rice with chicken that you love so much!”. At this point, I would know he doesn’t have cooking on his agenda today, again. Then I would say, never mind, I will toss something easy and you can help me prepare and do the dishes. He would happily oblige without any hesitation, relieved by the fact that I would not be making him cook today. So, when I pinged him in gtalk and asked him, “What about home cooked Nepali dinner tonight?”, his answer was “:D, is there going to be daal?”. So this is my partner’s thought about food and cooking. He’s a foodie as well but he hates to cook. So, as we walked back to our building, I did a mental scan of the ingredients in the refrigerator in order to decide the menu for dinner. I told him, today will be bodi aloo(long beans with potatoes), chana daal(yellow lentils), saag(green leafy veggie) and rice. A nodded his head with a wide grin on his face and said “love you budi, you’re the best!”. Although the dinner I mentioned is nothing fancy and back home in Nepal we eat “daal”(lentil soup), “bhat” (rice), “tarkaari”(veggie), “saag”(green leafy veggie) with “achar”(usually spicy tomato sauce), on almost every meal, for us, staying away from home, working full time with no family to support, it is sort of a small feast :). So as I reached my room and freshened up, A came along to help me. His plan was to clean and cut the veggies while I cooked. I gave him a list of ingredients that I would need for tonight’s cooking, crushed garlic, green chillies, long bean, chinese cabbage(saag) and one boiled potatoes. As he started taking the things needed out of the refrigerator, my phone rang and it was my mum. Let me give you a little background here, my mum misses me a lot. Her whole life has been around me, my brother and Bua(my father). So I try to talk to her almost everyday via Skype whenever possible. This call meant, come online on Skype. So, I had to leave the kitchen so that I could talk to mom for a while, I put the cooker with daal on stove and went to fetch my laptop giving instructions to A on how to get the ingredients ready. Then my normal conversation with mom started, first things first, we started by “What are you having for dinner?” and “What did you eat for lunch?”. As I was talking to my mom, I heard the pressure cooker whistle blow many times, but I ignored it thinking A is there. But the whistling would not stop, so I rushed out of the room to see what was going on in the kitchen. There I saw, A had neatly cut all the ingredients and placed it on the table, ready to be picked and tossed on a pan, the daal was still on the stove so I quickly switched it off(we have a electric infrared cooking stove) and said,”A honey, didn’t you realize daal was still cooking on the stove and it might get burned if we left if for a while longer”. His answer was,”No, I didn’t notice, why didn’t you tell me I had to switch it off as well!”, so thats how his system works, he has no instincts on cooking. After this we both smiled at his lack of instinct and I went back to Skype, wrapped up my conversation with mom and went to the kitchen to cook. I started by frying cumin seeds, onions, tomatoes and garlic(masala for the daal), after the masala was well cooked, I poured the daal on the pan and let it shimmer for a while. Then I poured the daal in the serving dish and cleaned the pan. In the same pan, I put some oil and started frying bodi, after the bodi was well cooked, I put the boiled potatoes, garlic, ground cumin and coriander powder, a little bit of onion and stirred it until the masala was cooked. After that I made saag, I like a simple plain saag, so for this I put a tiny bit of oil on the frying pan, fried one pod of garlic in the oil, then cooked the green leaves with a pinch of salt until just cooked and soft. And our dinner was ready :). That evening A ate with his hands. Later as he cleaned the dish, he thanked me for the wonderful nepali dinner.